Why Issue Same Driver’s License to Illegals with ‘Deferred Deportation’ as Legal Immigrants? Yet most Georgians will be surprised to learn that Georgia’s Department of Drivers Services (DDS), the agency responsible for our driving and ID credentials, has issued, renewed or replaced more than 50,000 driver’s licenses and/or official state ID Cards to illegal aliens. Incredible. These illegal aliens have either “deferred action on deportation” proceedings or are already under federal deportation orders. And that issuance of these official state documents is perfectly legal under current federal and state law. Surprisingly, the 2005 federal REAL ID Act, passed after the horror of the Sept. 2001 terror attack, says that states can optionally issue drivers licenses to illegals with “deferred action on deportation” and that the feds will allow this ID to be used to board airliners. The law says that “deferred action” is “evidence of lawful status” for federal acceptance of driver’s licenses as an official ID. The REAL ID Act guidelines from the feds are merely minimum requirements and standards for federal recognition – not legal requirements. Confusing, isn’t it? Many Georgia legislators think DDS should try harder to explain this scenario and how it is that DDS is issuing driver’s licenses to illegals. Benz and KIA executives here from Germany and Korea– all who entered the United States legally. Georgia has the choice to issue a driver’s license to those with deferred action that will still allow them to drive, but that does not fit the federal requirements to be used as “ID for federal purposes” – like boarding an airliner or entering a federal building. And we can – and I firmly believe we must — change the appearance of these credentials so that no one will mistake the holder for a legal immigrant or a legitimate guest worker here on a legal temporary visa. Currently at least two states, California and Michigan, issue multiple tiers of drivers licenses. The lower tiers are not recognized as federally-approved ID and cannot be used as such. But the bearer can still drive. I would use Mexico as another example, but Mexico does not allow any illegal aliens to obtain any type of driver’s license. Realizing the United States is not going to be as strict as Mexico, Georgia should issue a vertically oriented ID, like we do for young drivers, to illegals with “deferred action on deportation” or who have been ordered deported– despite that the feds say we are not required to do so. 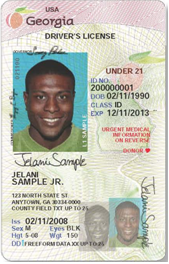 My bill, HB 484, pending in the Georgia Gold Dome requires the DDS to end its current practice and to replace the driving and ID credentials now issued to illegal aliens with a vertically oriented, brightly colored card. This new ID card is designed to make it unmistakably and visually clear that the “Driving Safety Card” ID is not acceptable for federal ID purposes. It would look something like the mock up pictured here. State Rep. Jeff Jones, R-Brunswick, is vice chairman of the House Motor Vehicles Committee.